Sarafan din jeans "Lee Cooper"
Sarafan din jeans (65% bumbac, 35% poliester). Bretele reglabile, cu catarama metalica. Bretelele nu sunt elastice. Se inchide in fata cu fermoar lung. Un buzunar lateral mic. Eticheta pe buzunar. Articol original. Masuri: bust - 90, talie - 82, sold - 100, lungime (umar -tiv) - 75. Echivalare: M.
Brand: Lee Cooper / Italia. Despre: " 1908 - Morris Cooper creates workwear production company the Morris Cooper factory, which later becomes Lee Cooper. Since its humble beginnings in the East end of London at a run-down premises on 94-96 Middlesex Street, Lee Cooper has now become recognised as Europe’s first and oldest, authentic denim brand. With the arrival of the first world war, the company converts its production of workwear clothing to military uniforms. Now known for creating uniforms for the British troops, Lee Cooper demonstrates strength and durability in its long-lasting products. 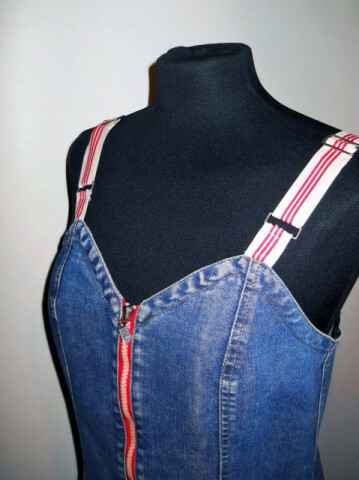 Lee Cooper is known for specialising in what was then known as ‘Navy’ clothing, which included denim, workwear, trousers and jackets. With a different direction, Morris Cooper opens a brand new factory in Stratford in East London. Over the year, the company grows significantly and as a result makes a profit by the end of the first year. As the Second World War approaches, Morris Cooper is contacted by the War Office, who places an order for a thousand denim fatigue suits. From this point the company is officially requisitioned by the British forces to manufacture uniforms for the armed forces. Lee Cooper’s work wear strengthens the brand’s reputation for making tough, hardwearing, high quality work clothes, and is in turn embraced by 80% of the UK market. The Lee Cooper brand appears in print for the first time. Lee Cooper introduces jeans for ladies. 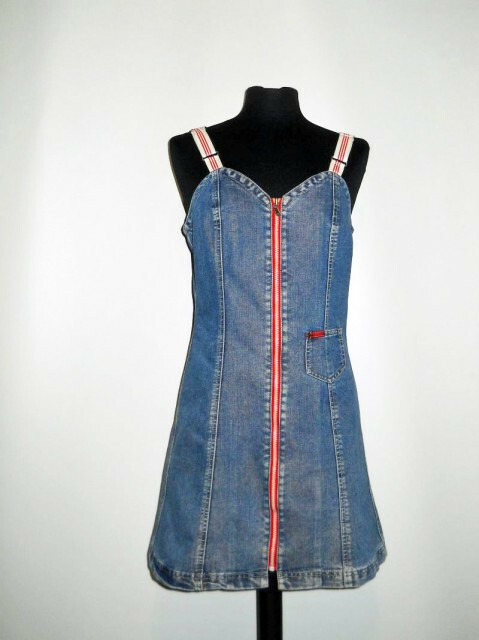 When Lee Cooper launches the “front zip” for their ladies jeans, there is an outcry from a shocked public. 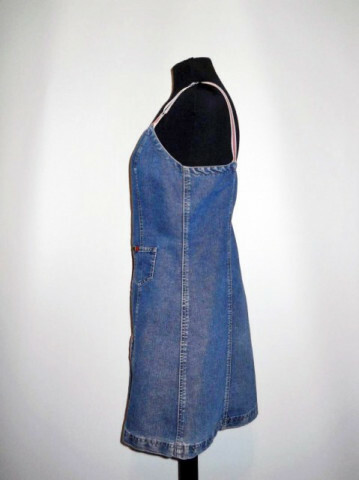 The range for women increases in size, and ladies dungarees appear the following year. Lee Cooper releases their first line of children’s clothing. Lee Cooper produce tartan slacks, the hottest item in the clothing range. The brand also start producing jeans for Wrangler. Lee Cooper's PVC jeans cause a stir in London's Carnaby Street. The vibrant 60s inspire a new range of coloured jeans which take London by storm. Lee Cooper t-shirts are introduced to the range. Flower power, peace and love result in the first Lee Cooper decorated jeans. 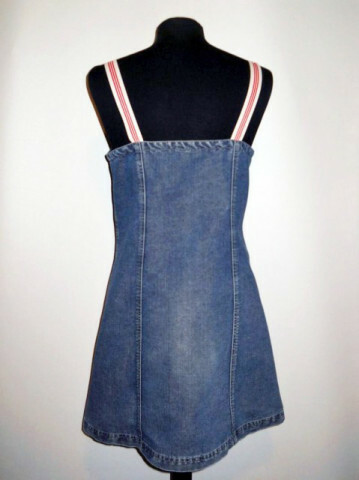 Lee Cooper mini skirts cause a stir across Europe as hemlines go from mini to maxi to mini again. The Lee Cooper product range introduces hot pants for girls, suede jeans for men and safari suits. 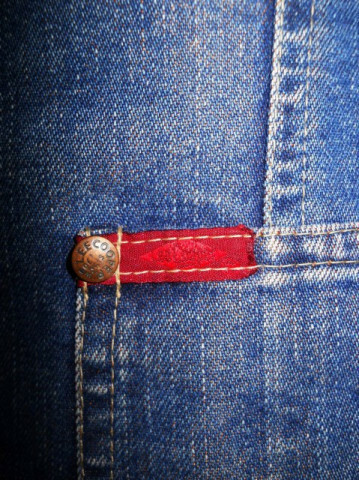 Then come the launch of the Lee Cooper “love” jean, the “cherry jean” and the first 32” bell-bottom flair. An ultra-modern, environmentally conscious production facility in Tunisia is opened. Lee Cooper tank tops and hipsters lead the way across the universities of Europe. Checks made an unexpected return to the Lee Cooper’s product range. 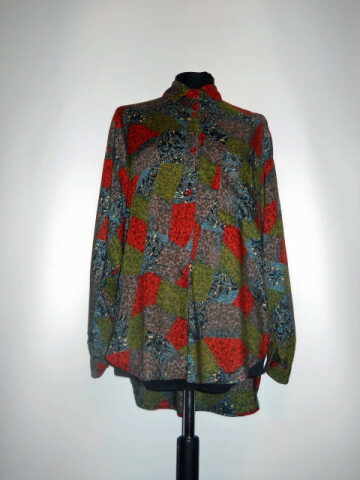 As the rock sound of the sixties gave way to the disco sound of the 70's, colourful corduroys and other fabrics come back into style. Corduroy is king as Lee Cooper re-emphasises colour and fabrics in the range. Punk and New Wave music hit the clubs with a vengeance, and so do Lee Cooper’s “stonewashed” jeans. Lee Cooper becomes a sponsor of legendary rock bands including the Rolling Stones, UB 40, Serge Gainsbourg, and Rod Stewart. The hipster jean makes a comeback as stretch denim hits Europe for the first time and becomes an instant success. Lee Cooper introduces stretch cord as the super skin tight "paint on" jeans take off. The Rolling Stones sponsorship takes Lee Cooper to concert fans across the UK, establishing Lee Cooper as the go-to brand for rockstars and music fans. Lee Cooper launch a new softer range of denim, emphasising its European origin. Punk music and fashion inspire Lee Cooper to offer unwashed jeans for the first time in 5 years. The brand later release “distressed” jeans. 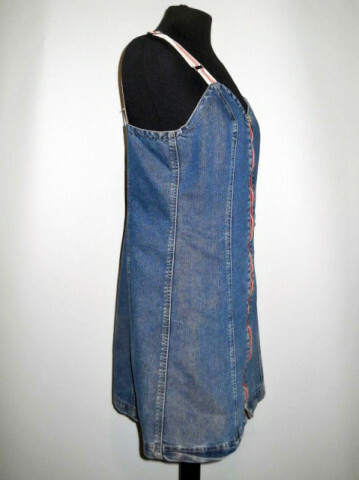 Stretch denim becomes popular again, and the fashion world is awash with Lee Cooper’s “acid wash” jeans. Lee Cooper shows its first shoe range. As eco-awareness grows, Lee Cooper makes use of enzyme washes for the first time. As demand increases, all production is moved to Lee Cooper’s world class factory in Tunisia. There is a major growth in global reach, with new licensed markets in former Eastern Europe, Asia and South America. The long standing Lee Cooper logo is changed to the one that we recognise today, and the LC range is introduced. Lee Cooper launches a new collection called ‘3 by 1’, the first 5 pocket slack jean to hit the market. Lee Cooper is recognised as one of the top selling authentic European denim brands. The company understands that innovation, comfort, style and performance is what the new generation are looking for, and with that in mind Lee Cooper introduces “Perform Your Life!” a new practical ethos for the brand. Lee Cooper confirms their commitment to Xfit Lycra, to create the best fitting denim in the world. And with Lee Cooper’s new brand ethos, they create a range of Aqua denim, a modern water resistant range of jeans. Following this, Lee Cooper releases the Platinum collection, a distinctive range themed on British heraldry. Attention to details include elaborate embroidery, mother of pearl buttons as well as exclusive platinum thread. French designer Jean-Charles de Castelbajac joins forces with Lee Cooper to create a collection called JCDC Denim. The collection is took inspiration from British 1960’s rock icons and rejuvenated Lee Coopers musical roots. Lee Cooper release a range inspired by The Beatles. Lee Cooper collaborates with french model and actress Lou, bringing back the brand’s heritage with previous brand ambassadors (and Doillon’s parents) Serge Gainsbourg and Jane Birkin. Lee Cooper supplies denim jackets and suits for over 1,200 members of the British Olympic and para-Olympic team for the opening ceremony of 2008 Beijing Olympics. The collection aims to break the mould of traditional parade and formal wear, and is designed by Olympian Sarah Winckless, a gold medallist in rowing to have both comfort and style.